This guide will help you to search for British Army records of soldiers who served between the 18th and early 20th centuries and covers the service of soldiers who were discharged right up until just before the start of the First World War. Although Britain has had a regular standing army since around 1660, there are few personnel records before the early 18th century. The Ministry of Defence website gives more detail on British Army ranks. For records of commissioned officers see our British Army officers up to 1913 guide. Many of the most detailed records of soldiers from this period are available online and it is possible to search for these records with no more than a soldier’s name, though you will usually need some way of distinguishing him from other soldiers with the same name, such as his date of birth. 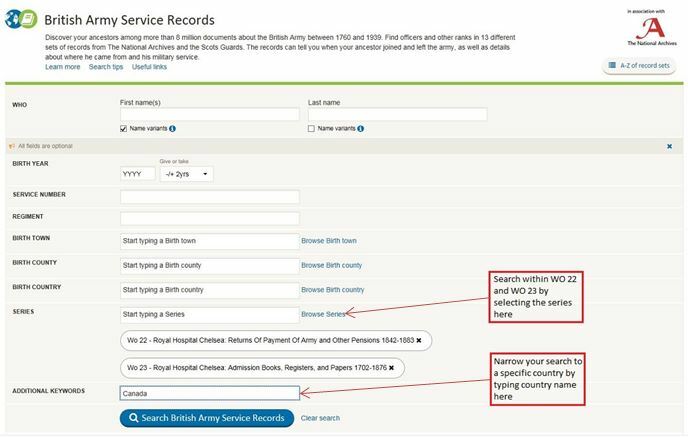 Search and download British Army service, pension and discharge records from findmypast.co.uk (£). These records were, in the vast majority of cases, originally retained for pension purposes. See sections 4, 5 and 6 for more advice on pension and discharge records, including how to find those that are not online. Search by name in the campaign medal and award rolls (WO 100) on Ancestry.co.uk (£) for records of medals awarded for service. The medal rolls do not usually contain biographical information. You can also search these records on microfilm at The National Archives at Kew, but you will need to know the campaign and the relevant regiment to use these records. Download, free of charge, digital microfilm copies of Royal Hospital Chelsea admissions books for soldier with disabilities 1715-1873. These registers list men awarded out-pensions following their discharge from the regular army or the militia on grounds of disability (WO 116/1-165). See our guide to free online records for advice on how to use digital microfilm. More records of disability pensions are available in series PIN 71 but these records are not available online – see section 4 for more details. Download, free of charge, digital microfilm copies of admission books from Royal Hospital Chelsea for pensions awarded to soldiers for length of service 1823-1913 (WO 117). See our guide to free online records for advice on how to use digital microfilm. Search for and download attestation and discharge papers (£) from findmypast.co.uk for men serving in the Imperial Yeomanry during the Second Boer War, also know as the South African War (WO 128). See section 10 for advice on finding other Boer War records. Search for and download service records of the Household Cavalry (£), including the Life Guards, Royal Horse Guards and Household Battalion 1799-1920 from record series WO 400. Search for and download certificates of service (£) from records series WO 119 on findmypast.co.uk for men awarded out-pensions by the Board of Kilmainham Hospital. Search the Royal Hospital Chelsea regimental registers of pensioners who served in Canada (£) between 1713 and 1882 from record series WO 97 and WO 120 on Ancestry.co.uk. There remains a significant number of British Army records for soldiers from this period that cannot be viewed online. To view these records, the most significant of which are highlighted in the following sections of this guide, you will either need to visit us to view them in person at our building in Kew, order copies of records to be sent to you (you will need the exact reference for the record) or pay for research. Where records have not been digitised you will usually need to know which regiment an individual served in to find records of him. This is especially so if he was, like most soldiers, not discharged to pension. In the absence of a pension record and without a known date of discharge the best place to start a search is in the muster rolls and pay lists. You will need to know either where in the world he served at any point during his service or at least one of the regiments he served with to make a start. Of limited detail by themselves, tracing a soldier’s career through the muster lists should lead you to a discharge date and would therefore allow you to find a record of discharge – likely to be the most detailed record available if the soldier did not receive an army pension. Most soldiers were not discharged to pension and for those that weren’t the number and detail of surviving records is likely to be reduced. There are still, however, records which you can search for. Some of the most detailed documents of soldiers’ service up until the First World War are records that were kept for pension purposes. If an individual received an army pension there is a better than average chance that there will be a record for him. Most of the pre-First World War British Army pension records held at The National Archives originate from the Royal Hospital Chelsea in London and the Royal Hospital Kilmainham in Dublin. These were hospitals set up, in 1679 and 1681 respectively, to administer army pensions and look after army pensioners. The hospitals in Ireland and England reflected the separate army establishments for the two countries, which did not become joined until the Act of Union in 1800. From the late 17th century, soldiers who left the army with a disabling injury, as invalids or after completing an agreed term of service, were entitled to a pension from one of these two army veterans hospitals. In December 1822 the payment of Kilmainham out-pensions was taken over by Chelsea Hospital, whilst in-pensioners remained in Kilmainham until 1929, when the last transferred to Chelsea. Some ex-soldiers became residents of these veterans hospitals and were known as in-pensioners. Most, however, were out-pensioners, receiving a pension administered by the hospitals but not actually residing in them. Both in-pensioners and out-pensioners are often referred to simply as pensioners, or sometimes Chelsea pensioners. To be eligible for admission as an in-pensioner a man had to be a life pensioner of the army (that is, in receipt of a service or disability pension), aged 55 or more (unless in receipt of a disability pension) and free from the responsibility of supporting a wife or children. It is not always possible to find this out other than by looking for a pension record but a useful alternative source is the census. Many individuals are listed on census records as “Army pensioner”. Censuses from 1841 to 1911 are available to search and view online. For more details on how to access and search for censuses, see our guide to census records. Many of the most significant series of British Army pension records are now available to view online (see section 2). 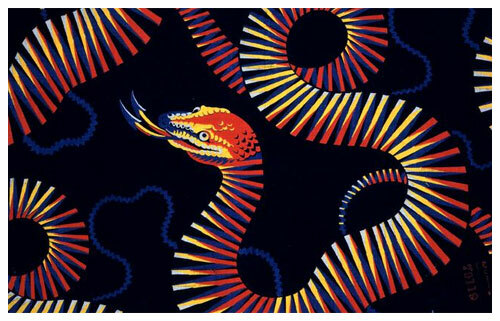 Some records of this type, however, are not available online. Though some can be found searching with a soldier’s name, in general it will help to know when an ex-soldier was drawing his pension, or, even more usefully, to have at least a rough idea of when a soldier was first granted his pension. Registers of admissions to pensions from Royal Hospital Chelsea arranged by regiment in WO 120. There is a name index for 1806-1836 only, and the volumes for 1839-1843 each have an index included. There are discreet sets of records for out-pensioners based overseas. Records of payments made to pensioners living overseas, whether in British colonies or foreign countries, are held in series WO 22 and WO 23, available to search and download on Findmypast.co.uk (£), as described in section 2. Though the appearance of individuals on muster rolls and pay lists are not determiners of whether or not they received a pension, they are particularly useful records for men who were not discharged to pension as they provide the enlistment date, movements and discharge date of all soldiers in the British Army. Refer to the British Army muster rolls and pay lists c.1730-1898 research guide to find out which series to consult for the period 1732 to 1878. For 1878 to 1898, browse WO 16 to find the relevant regiment or regimental district. Trying to trace an individual soldier in this way can be time-consuming, with no guarantee of success. The registers are not complete but they are a useful potential source of information. A number of these pieces contain information on soldiers whose discharge document would not be in WO 97 (see section 2). Until 1855 ordnance troops, which included the Royal Artillery, were the responsibility of the Board of Ordnance, not the War Office. There are therefore some series of records specifically for Royal Artillery personnel. Supplementary records of services are preserved for soldiers in the Royal Artillery, 1791 to 1855, and the Royal Horse Artillery, 1803 to 1863, in WO 69. You can search by name in our catalogue within WO 69. This series also contains other useful material, up to 1913. Click on the series references below to search or browse these records by unit. These records are of soldiers who enlisted in units locally raised in South Africa. Please note that many soldiers and officers who served in the British Army during the Second Boer War also served in the British Army during the First World War (1914-1918). When this happened, then pre-1914 record of service (including Boer War) is more likely to be among First World War service records. You can search and download campaign medal rolls (WO 100) at Ancestry.co.uk (£). They list militiamen who received the Queen’s (or King’s) South Africa Medal or the Queen’s Mediterranean Medal, while serving with the regular army. Except for the Guards regiments and the Household Cavalry, regimental museums do not hold records of service of their men and officers, although they often hold other records which can be useful to people researching their military ancestors. Records of the Guards regiments (Coldstream, Grenadier, Irish, Scots and Welsh Guards) are accessible by writing to the regimental headquarters of each regiment. All five regimental headquarters are based at Wellington Barracks, Birdcage Walk, London SW1E 6HQ. Some of these records were destroyed by enemy bombing whilst stored in the Guards chapel during the Second World War. Microfilm copies of WO 400 (see section 2.6) are held at the Household Cavalry Museum Archive in Windsor. It’s best to contact the museum for access conditions before visiting. The National Army Museum holds records of soldiers’ effects for April 1901 to March 1960. Those from 1901 to 1929 are available on Ancestry. For 1930-1960 contact the National Army Museum directly.